This book starts slow and doesn’t speed up very fast either. But there are inklings that something will happen because of some judicious foreshadowing. And it’s not a “mystery” or a thriller in any sense of the term. It’s a very gentle book with a mystery involved. And Rich Orlow is terrific as the reader. The first person narrator is the 12 years old the son of an excellent minister and a less than fulfilled mother who lives in a small town in Minnesota. This is the summer of 1961. Be patient, the story wanders around introducing the characters who will figure later. There’s Nathan Drum, the too-good minister father, his somewhat rebellious but very loving wife, Ruth, Frank, our hero who is really pretty typical. Then there’s his sister Ariel, a talented musician, and his brother Jake who is terribly embarrassed by a serious stutter but is spiritually sensitive. And there are Ruth’s parents who are not entirely pleased with Nathan. In the community there’s Gus, an old war-buddy of Nathan’s, as well as Doyle and a couple of other police officers. There’s Warren Redstone, a Native American just moved to town to be with relatives. There’s Carl Brandt, Ariel’s boyfriend, and his family, there’s Emil Brandt, the musician friend of Ruth’s who is teaching Ariel, and his disturbed sister, Lisa. And there’s the town bully, Morris Engdahl. These are very real characters, broken and disappointed people, burdened people. And the Drums are a complete family within a very real-feeling community – and there comes a loss which they all have to deal with. Frank is 52 years old at the time of the telling – he’s remembering that summer which started out with the death of a local boy, then finding the dead body of a vagrant. Then … the foreshadowing and then the tale. The book is way more than a genre mystery. 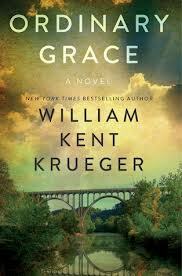 It’s well written and seems to exude a kind of spiritual wisdom about respecting people, surviving loss, love and grace.